UKAA are open on bank holiday Monday so why not drop in and browse our extensive selection of interior and antique garden products at our reclamation yard in Cannock Wood Staffordshire. 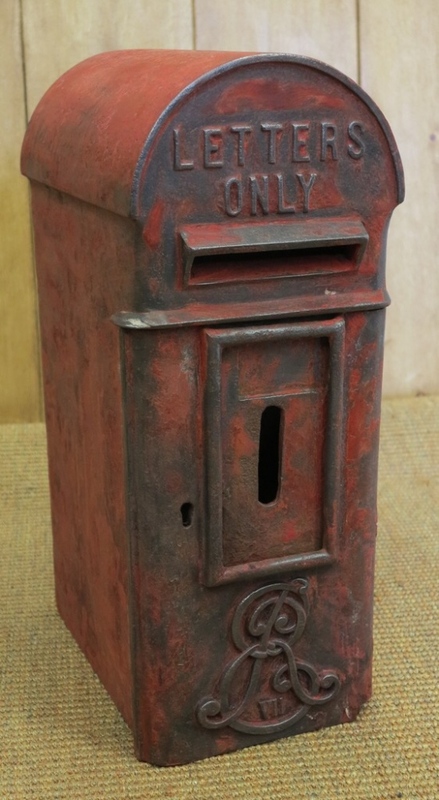 Here at UKAA we always have a large selection of ex Royal Mail post boxes and letter boxes for sale. 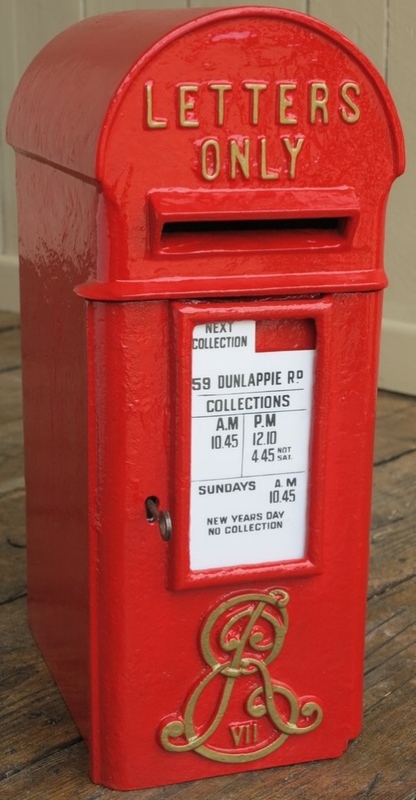 These fully refurbished reclaimed red letter boxes are ideal to use as post boxes at home or we can even paint white for weddings or christenings. All our old post boxes come complete with there original Chubb locks and keys. Pictured below is Enzo the youngest member of the UKAA team with one of our original Royal Mail post boxes. For more information please call the team on 01543 222923 or live chat during office hours. At UKAA we fully refurbish in house our ex Royal Mail Original Post Boxes, they are then advertised for sale on our website. The boxes are sympathetically refurbished to keep as much of their original character as possible. The steps below are of the main stages of refurbishment of an Edward VII Original Royal Mail Post Box, the box is Circa 1901 and we have tried to keep as many original features as possible, such as the original lock, cage and keys. 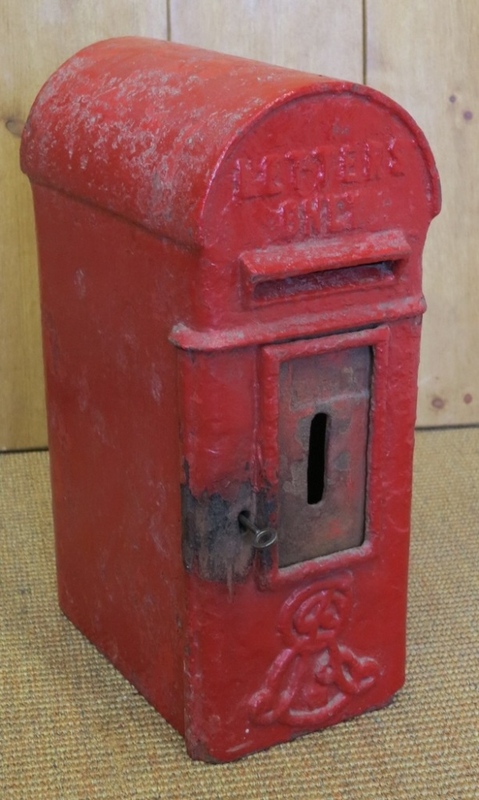 The image below is of a Royal Mail Post Box ready for restoration. Step 1, We initially use the grinder with a wire brush tool to remove any loose paint or rust on the outside of the Royal Mail Post Box while keeping as much character and original paint as possible. The inside of the box is then cleaned. Pictured below is of the Royal Mail Post Box once all the loose original paint has been removed. 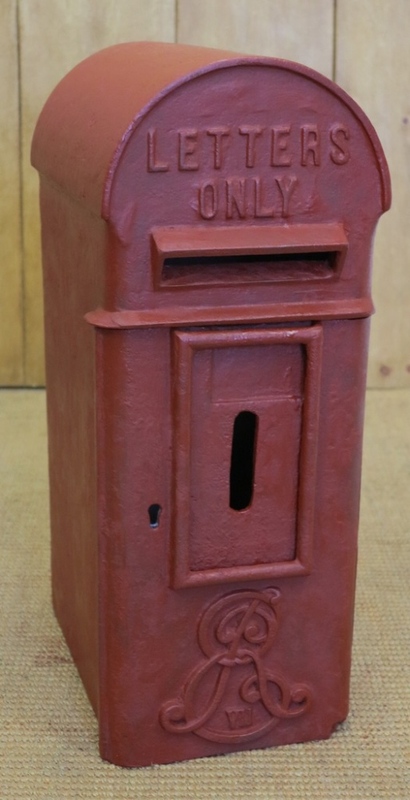 Step 2, The outside of the post box is painted in a coat of red oxide primer and then receives a coat of red undercoat. Pictured below is of a primed and undercoated Edward VII Royal Mail Post Box. Step 3, We remove the cage from the post box and then the inside is coated in a suitable metal primer and then a top coat is applied, we have used Farrow and Ball Lamp Room Grey in a gloss finish. 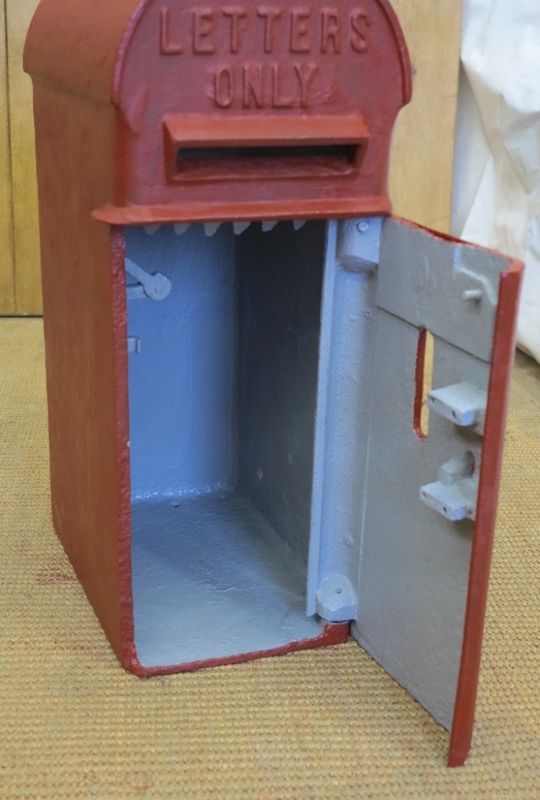 The image below is of the inside of the Royal Mail Post Box once we have undercoated and applied a top coat. Step 4, The cage and the collection box are sprayed in silver paint and then refitted on to the post box, the lock is fully refurbished by our local Locksmith. 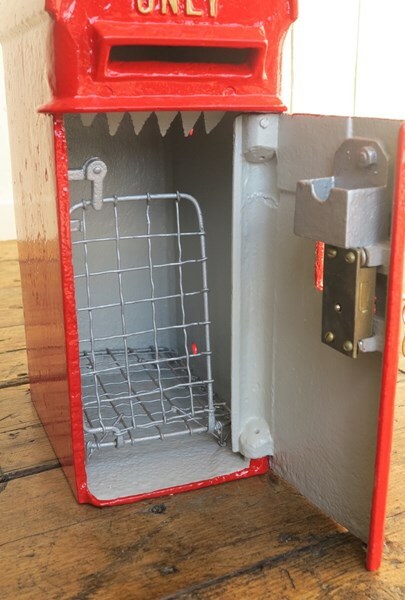 Pictured below is of the inside of the original Edward the 7th post box once the cage and lock have been fully refurbished and fitted. 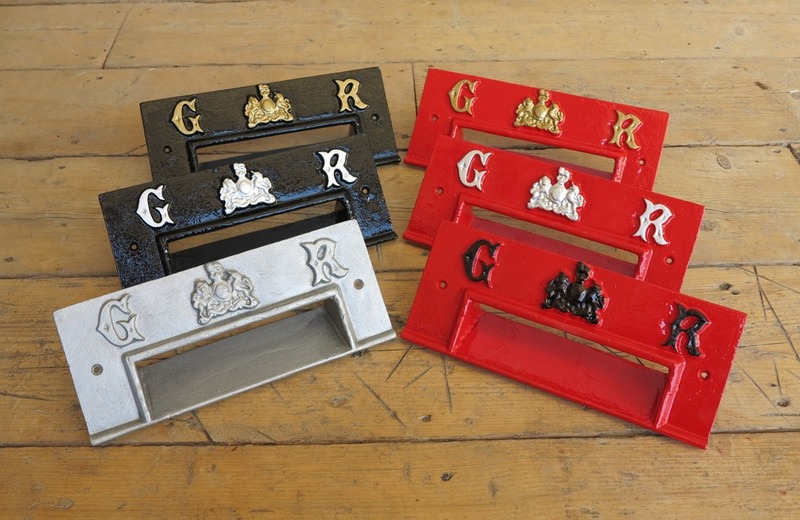 Step 5, The outside of the box receives a minimum of four coats of a good quality Post Office Red paint and the lettering is highlighted in gold, we have then fitted the post boxes original collection plate. 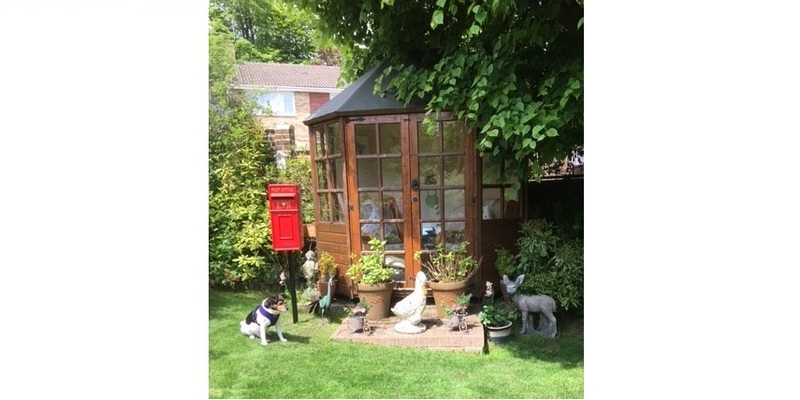 The picture below is of the fully refurbished Edward the 7th Post Box ready for sale. The BBC website has featured a report on a group of Royal Mail Post Box enthusiasts today. There work maybe under threat, to view the BBC report in full please click here. To view our Royal Mail Post Boxes we currently have for sale please view here or call the team on 01543 222923 for more information. 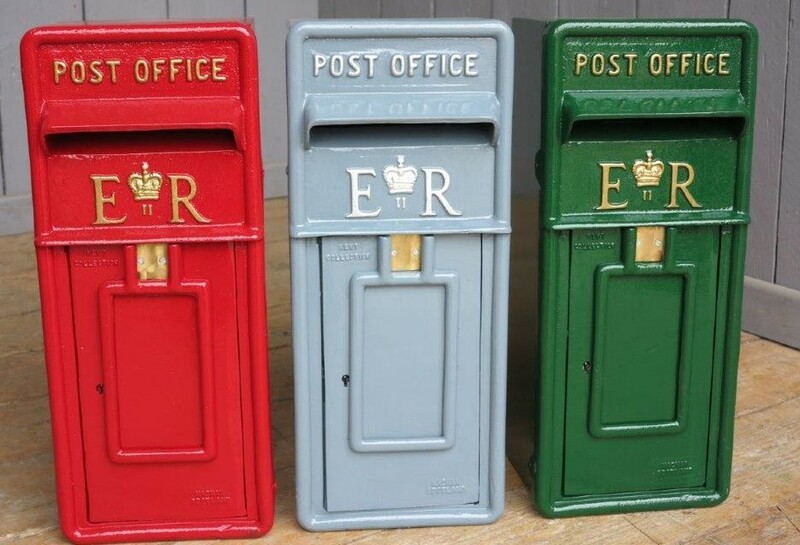 At UKAA we can paint our original Royal Mail post boxes in any bespoke paint colour. Take a look at our post boxes that have been sent out to our lovely customers over the last week, from racing green to a traditional red. We have painted all three bespoke to our customers requirements, the grey box in the middle is a colour match to our customers front door! Or of course you can choose to have your post box painted on the original Post Office Red, for more information on the post boxes we currently have for sale please call the team on 01543 222923. As you can see we not only hand paint the boxes we also can paint the lettering in contrasting colours, our most popular colour for the lettering is either gold or black. However we can order the paint in whatever colour combination you like, its up to you! Tags : Post Box . Royal Mail . for sale . bespoke paint colour UKAA. We have never had these before and we are very lucky to have this many available. We are able to paint your aperture in either Red or Black for you at no extra cost with either Gold or Silver lettering.